Encountering a collection of Allan McCollum's Plaster Surrogates in an art context can be a disconcerting experience. They seem to frustrate both the habitual modes of approaching works of art and the expectations that one implicitly has of an "art experience." A Surrogate is never found in isolation, but always as part of a profusion of seemingly identical objects, giving the impression of an arbitrary selection from a potentially infinite set. 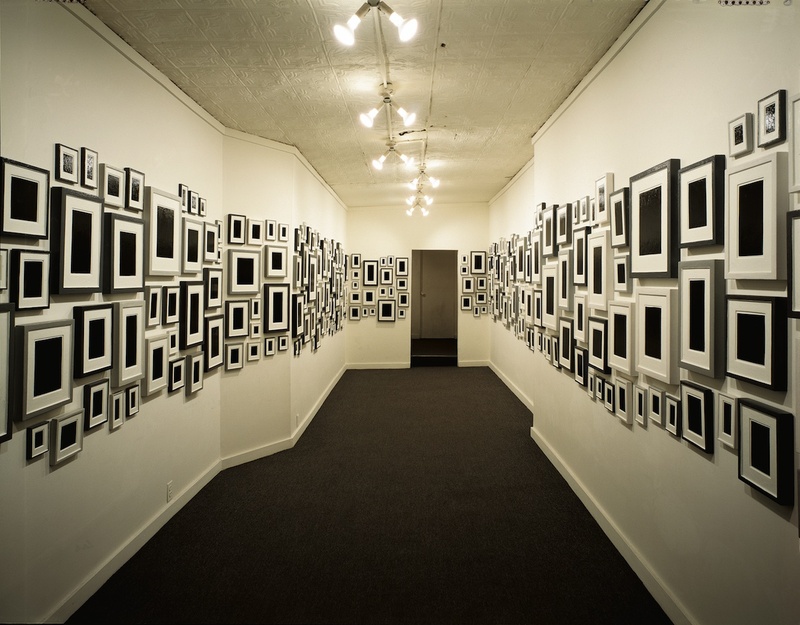 They initially appear to be framed and mounted canvases of slightly irregular dimensions in monochrome black, clustered tightly on the gallery wall. However, upon closer inspection, the division between painting and frame dissolves: they are plaster structures painted with enamel-there is no frame and there is no canvas. The Surrogates, of which McCollum has made hundreds, are blank paintings cast from an absent original. The sheer strangeness of the way in which the Surrogates reframe the experience of viewing art objects raises numerous questions: How to engage with "paintings" from which all content has been emptied and in which formal variation has been reduced to minimal difference? How to distinguish between the authentic and the performed, between the genuine and the artificial? And, if these objects are surrogates, then what are they surrogates for? The relation of McCollum's troubling things to painting is ambiguous. The Surrogates are produced through reproductive processes of molding and casting. However, each Surrogate is also hand painted-both center and frame-paradoxically emphasizing the physically present trace of the artist's material labor while undermining any received ideas about manual skill and creative expenditure in painting. McCollum's paintings are the result of automatic, almost industrial processes-a production line model of painterly work. Through these techniques, McCollum performs the minimal gestures that could conceivably produce objects qualifying as paintings. McCollum, then, produces a surrogate of painting, an empty signifier that stands "in the place of social relations, objectifying them in a displaced way," as George Baker has astutely put it. The surrogate fulfills the task of painting: it facilitates aesthetic engagement and economic exchange, produces discourse, and takes up space on the wall. It does all the things that a painting should do. But it is not a painting. It is a fraud, a fake, a stand-in. This problem is evinced in May I Help You?, 1991, a performance by Andrea Fraser, executed "in cooperation" with McCollum. In the piece, performers in the guise of gallery assistants greet the visitors to an exhibition of Surrogates at the now-defunct New York gallery American Fine Arts, Co., and conduct a tour through the exhibition of near-identical works, acting out a range of reactions for the viewer. Moving from piece to piece, the performers rapidly shift personas (critic, collector, dealer, amateur) and languages, from the rhetoric of distinction to that of confectionary delight, from financial appraisal to philistine rejection. The works, then, function as the absent center around which a proliferation of institutionalized identities and discourses whir. Fraser's intervention exploits the Surrogates' prop-like character-their blurring of the distinction between reality and artifice-in order to make manifest the social armature that sustains the aesthetic encounter and the projected values it produces. McCollum's conventional signs for "painting" cast the entire space of the gallery as a stage for performance.